You may ignore this section if your computer has a working 9-pin serial port and your dobby has a matching 9-pin or 25-pin socket. Most dobbies were designed around the classic RS232 serial port that was common in the 1980's and 1990s. 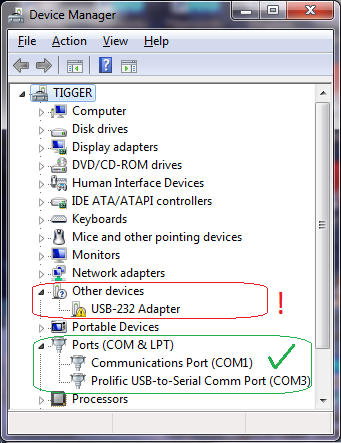 Current PCs have USB, but no RS232 serial port, so a USB-serial converter is needed which can connect from a USB port on the PC to the serial input of the dobby. Some newer dobbies have the USB device built-in, and can connect with a normal USB cable. Otherwise, an in-cable adapter is needed which links from a USB socket on the PC to a 9-pin or 25-pin serial socket on the dobby. In either case, the USB device requires driver software so that Windows can recognize the device. In many cases, the driver may be self-installing (but not for XP or Vista). Otherwise, driver software is provided by the manufacturer of the device and can be downloaded from the manufacturer's website. It is important to choose a driver that matches your Windows version. First thing to try is to connect up the dobby and switch on if it has built-in USB. If you use an in-cable adapter, you only need to connect the adapter to the PC. The PC needs to have an open internet connection in order to acquire the necessary driver. If you are lucky, after a minute or so a message will appear at bottom right corner of your screen "Your device is ready to use". To verify the status of the USB device, go to the Windows Control Panel and choose Device Manager (try System and Security or Hardware and Sound if your Control Panel is subdivided into Categories, then choose Device Manager). In Windows 10, you can also go to go to Settings and type Device Manager into the Search box. If the driver has been installed properly, your device will be listed in the section Ports (COM & LPT) and show a COM number, e.g. COM3 in this example. You can verify that it's the right device by disconnecting (type Ctrl+R to refresh the list if you have Windows XP or Vista). The device should disappear from the list. If there is no driver or the driver is improperly installed, the device will be listed in Other Devices or may show a warning triangle next to the device name. If your device is listed in Other Devices or is marked with a warning triangle, you can retry the driver self-installation by right-clicking on the item; then choose Update Driver Software from the pop-up menu. You must have an open internet connection for this to work. This option may not be available for Windows XP or Vista. The COM number displayed for the adapter in Device Manager is the COM number you should select when setting up the loom in Silver Plus. Fiberworks scans COM ports up to COM15. If device manager shows a higher COM number, use Device Manager to reset the COM number lower. 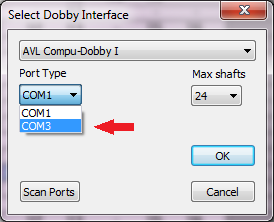 Unless you have an actual 9-pin serial port, never choose COM1 as the COM number for a USB device used to connect the dobby. Louet Megado, Octado and Magic Dobby with USB and without 9-pin serial socket (manufactured 2014 or later).